Chris Cobb is an expert at setting up affilaite websites. 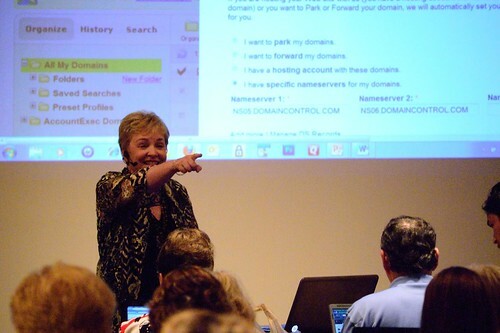 She taught beginners how to set up an affiliate site from scratch at the Niche Affiliate Marketing System (NAMS) Workshop 6. The students didn’t just learn how. They built an affiliate website during the workshop. 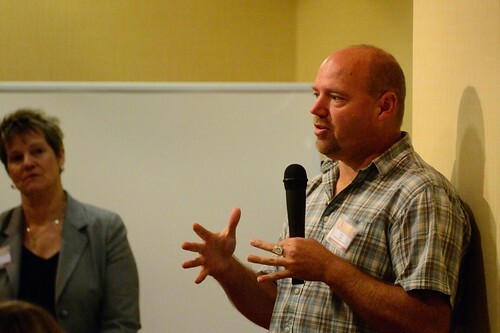 This photo was captured by Trevor Carr at the 6th Niche Affiliate Marketing System (NAMS) Workshop. 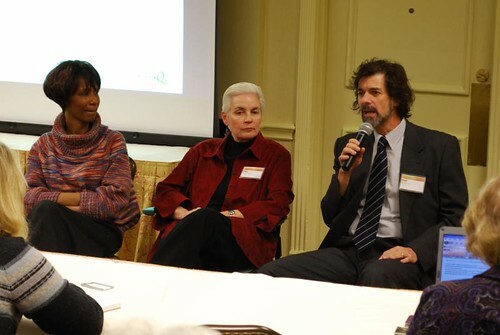 The event took place on August 19-21, 2011 in Atlanta, GA.
Go to www.namsexperience.com to learn more about the workshop. 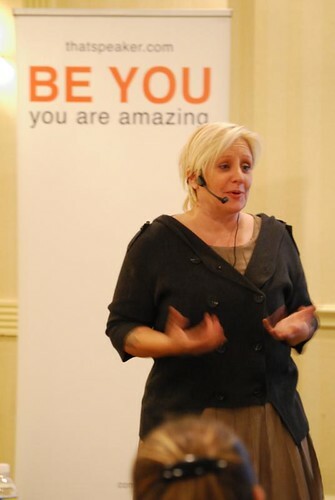 This photo was captured by Trevor Carr at the 6th Niche Affiliate Marketing System (NAMS) Workshop. 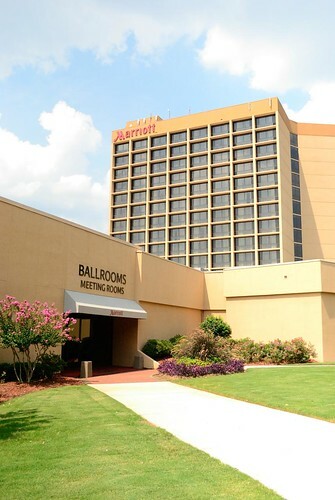 The event took place at the Atlanta Marriott Century Center on August 19-21, 2011 in Atlanta, GA.
Mary Wilhite, Ellen Britt, and Kevin Riley leading a workshop session together. Photo was captured at the Niche Affiliate Marketing System Workshop held in Atlanta, GA on January 29-February 1, 2010. Tony Laidig shared some of his online marketing secrets with a class of advanced students at the Niche Affiliate Marketing System (NAMS) Workshop 6. The room was full of affiliate marketing experts to learn from. The Buddhas of Bamiyan were two 6th century monumental statues of standing buddha carved into the side of a cliff in the Bamyan Valley in the Hazarajat region of central Afghanistan, 230 km (140 mi) northwest of Kabul at an altitude of 2,500 meters (8,202 ft). Built in 507 CE, the larger in 554 CE, the statues represented the classic blended style of Gandhara art. The main bodies were hewn directly from the sandstone cliffs, but details were modeled in mud mixed with straw, coated with stucco. This coating, practically all of which wore away long ago, was painted to enhance the expressions of the faces, hands and folds of the robes; the larger one was painted carmine red and the smaller one was painted multiple colors. The lower parts of the statues’ arms were constructed from the same mud-straw mix while supported on wooden armatures. It is believed that the upper parts of their faces were made from great wooden masks or casts. Rows of holes that can be seen in photographs were spaces that held wooden pegs that stabilized the outer stucco. The two Buddhas were dynamited and destroyed March 2001 by Taliban members on orders from leader Mullah Mohammed Omar, after the Taliban government declared that they were idols and therefore anti-islamic. International opinion strongly condemned the destruction of the Buddhas, which was viewed as an example of the intolerance of the Taliban. Japan and Switzerland, among others, have pledged support for the rebuilding of the statues. Photojournalist David Adams filmed the Buddhas prior to their destruction for an episode of Journeys to the Ends of the Earth, a travel series for the Discovery Channel. Bamiyan lies on the Silk Road, which runs through the Hindu Kush mountain region, in the Bamiyan Valley. The Silk Road has been historically a caravan route linking the markets of China with those of the Western world. It was the site of several Buddhist monasteries, and a thriving center for religion, philosophy, and art. Monks at the monasteries lived as hermits in small caves carved into the side of the Bamiyan cliffs. Most of these monks embellished their caves with religious statuary and elaborate, brightly colored frescoes and oil-based paintings. It was a Buddhist religious site from the 2nd century up to the time of the Islamic invasion in the later half of the 7th century. Until it was completely conquered by the Muslim Saffarids in the 9th century, Bamiyan shared the culture of Gandhara. The two most prominent statues were the giant standing Buddhas Vairocana and Sakyamuni, identified by the different mudras performed. The Buddha popularly called "Solsol" measures 53 meters tall, and "Shahmama" 35 meters – the niches in which the figures stand are 58 and 38 meters from botom to top. Before being blown up in 2001 they were the largest examples of standing Buddha carvings in the world (the 8th century Leshan Giant Buddha is taller, but the statue is sitting). Since then the Spring Temple Buddha has been built in China, and at 128 m (420 ft) it is the tallest statue in the world. Plans for the construction of the Spring Temple Buddha were announced soon after the blowing up of the Bamiyan Buddhas and China condemned the systematic destruction of the Buddhist heritage of Afghanistan. The smaller of the statues was built between 544 and 595, the larger was built between 591 and 644. They are believed to have been built by the Kushans, with the guidance of local Buddhist monks, at the heyday of their empire. The larger figure was also said to portray D?pankara Buddha. They were perhaps the most famous cultural landmarks of the region, and the site was listed by UNESCO as a World Heritage Site along with the surrounding cultural landscape and archaeological remains of the Bamiyan Valley. Their color faded through time. Chinese Buddhist pilgrim Xuanzang visited the site on 30 April 630 CE, and described Bamiyan in the Da Tang Xiyu Ji as a flourishing Buddhist center "with more than ten monasteries and more than a thousand monks". He also noted that both Buddha figures were "decorated with gold and fine jewels" (Wriggins, 1995). Intriguingly, Xuanzang mentions a third, even larger, reclining statue of the Buddha. A monumental seated Buddha, similar in style to those at Bamiyan, still exists in the Bingling Temple caves in China’s Gansu province. In CE 1221 with the advent of Genghis Khan "a terrible disaster befell Bamiyan, nevertheless, the statues were spared. Later, the last Mughal emperor, Aurangzeb, tried to use heavy artillery to destroy the statues. Another attempt to destroy the Bamiyan statues was made by the 18th century Persian king Nader Afshar, directing cannon fire at them. Afghan king Abdur Rahman Khan destroyed its face during military campaign against Shia Hazara rebellion. A Frenchman named Dureau had pictured it in 1847. Abdul Wahed, a Taliban commander operating in the area, announced his intention to blow up the Buddhas in 1997 even before he had taken control of the valley. Once he was in control of Bamiyan in 1998, Wahed drilled holes in the Buddhas’ heads for explosives. He was prevented from taking further action by the local governor and direct order of Mullah Omar, although tyres were burnt on the head of the great Buddha. In July 1999, Mullah Mohammed Omar issued a decree in favor of the preservation of the Bamiyan Buddha statues. Because Afghanistan’s Buddhist population no longer exists, so the statues are no longer worshiped, he added: "The government considers the Bamiyan statues as an example of a potential major source of income for Afghanistan from international visitors. The Taliban states that Bamiyan shall not be destroyed but protected.In early 2000, local Taliban authorities asked for UN assistance to rebuild drainage ditches around tops of the alcoves where the Buddhas were set. However, Afghanistan’s radical clerics began a campaign to crack down on "un-Islamic" segments of Afghan society. The Taliban soon banned all forms of imagery, music and sports, including television, in accordance with what they considered a strict interpretation of Sharia. According to UNESCO Director-General Koïchiro Matsuura, a meeting of ambassadors from the 54 member states of the Organisation of the Islamic Conference (OIC) was conducted. All OIC states – including Pakistan, Saudi Arabia and the United Arab Emirates, three countries that officially recognised the Taliban government – joined the protest to spare the monuments. Saudi Arabia and the UAE later condemned the destruction as "savage". Although India never recognised the Taliban regime in Afghanistan, New Delhi offered to arrange for the transfer of all the artifacts in question to India, "where they would be kept safely and preserved for all mankind." These overtures were rejected by the Taliban. Pakistani president Pervez Musharraf sent Moinuddin Haider to Kabul to try to prevent the destruction, by arguing that it was un-Islamic and unprecedented. According to Taliban minister, Abdul Salam Zaeef, UNESCO sent the Taliban government 36 letters objecting to the proposed destruction. He asserted that the Chinese, Japanese and Sri Lankan delegates were the most strident advocates for preserving the Buddhas. The Japanese in particular proposed a variety of different solutions to the issue, these included moving the statues to Japan, covering the statues from view and the payment of money. A statement issued by the ministry of religious affairs of Taliban regime justified the destruction as being in accordance with Islamic law. Abdul Salam Zaeef held that the destruction of the Buddhas was finally ordered by Abdul Wali, the Minister for the Propagation of Virtue and the Prevention of Vice. The statues were destroyed by dynamite over several weeks, starting on 2 March 2001, carried out in stages. Initially, the statues were fired at for several days using anti-aircraft guns and artillery. This caused severe damage, but did not obliterate them. During the destruction, Taliban Information Minister Qudratullah Jamal lamented that, "this work of destruction is not as simple as people might think. You can’t knock down the statues by shelling as both are carved into a cliff; they are firmly attached to the mountain." Later, the Taliban placed anti-tank mines at the bottom of the niches, so that when fragments of rock broke off from artillery fire, the statues would receive additional destruction from particles that set off the mines. In the end, the Taliban lowered men down the cliff face and placed explosives into holes in the Buddhas. After one of the explosions failed to completely obliterate the face of one of the Buddhas, a rocket was launched that left a hole in the remains of the stone head. On 6 March 2001 The Times quoted Mullah Mohammed Omar as stating, "Muslims should be proud of smashing idols. It has given praise to God that we have destroyed them. During a 13 March interview for Japan’s Mainichi Shimbun, Afghan Foreign Minister Wakil Ahmad Mutawakel stated that the destruction was anything but a retaliation against the international community for economic sanctions: "We are destroying the statues in accordance with Islamic law and it is purely a religious issue. On 18 March, The New York Times reported that a Taliban envoy said the Islamic government made its decision in a rage after a foreign delegation offered money to preserve the ancient works. The report also added, however, that other reports "have said the religious leaders were debating the move for months, and ultimately decided that the statues were idolatrous and should be obliterated. Then Taliban -at-large Sayed Rahmatullah Hashemi said that the destruction of the statues was carried out by the Head Council of Scholars after a Swedish monuments expert proposed to restore the statues’ heads. Hashimi is reported as saying: "When the Afghan head council asked them to provide the money to feed the children instead of fixing the statues, they refused and said, ‘No, the money is just for the statues, not for the children’. Herein, they made the decision to destroy the statues; however, he did not comment on the claim that a foreign museum offered to buy the Buddhist statues, the money from which could have been used to feed children. The destruction of the Bamiyan Buddhas despite protests from the international community has been described by Michael Falser, a heritage expert at the Center for Transcultural Studies in Germany, as an attack by the Taliban against the globalising concept of "cultural heritage". The director general of the U.N. Educational, Scientific and Cultural Organization (UNESCO) Koichiro Matsurra called the destruction a "…crime against culture. It is abominable to witness the cold and calculated destruction of cultural properties which were the heritage of the Afghan people, and, indeed, of the whole of humanity. Though the figures of the two large Buddhas are almost completely destroyed, their outlines and some features are still recognizable within the recesses. It is also still possible for visitors to explore the monks’ caves and passages that connect them. As part of the international effort to rebuild Afghanistan after the Taliban war, the Government of Japan and several other organizations, among them the Afghanistan Institute in Bubendorf, Switzerland, along with the ETH in Zurich, have committed to rebuilding, perhaps by anastylosis, the two larger Buddhas. In May 2002, a sculpture of the Buddha was carved out of a mountain in Sri Lanka. It was designed to closely resemble one of the Buddhas of Bamiyan. The Afghan government has commissioned Japanese artist Hiro Yamagata to recreate the Bamiyan Buddhas using fourteen laser systems to project the images of the Buddhas onto the cliff where they once stood. The laser systems will be solar and wind-powered. The project, which will cost an estimated million, is currently pending UNESCO approval. In September 2005, Mawlawi Mohammed Islam Mohammadi, Taliban governor of Bamiyan province at the time of the destruction and widely seen as responsible for its occurrence, was elected to the Afghan Parliament. On 26 January 2007, he was assassinated in Kabul. Swiss filmmaker Christian Frei made a 95-minute documentary titled The Giant Buddhas (released in March 2006) on the statues, the international reactions to their destruction, and an overview of the controversy. Testimony by local Afghans validates that Osama Bin Laden ordered the destruction and that, initially, Mullah Omar and the Afghans in Bamiyan opposed it. Since 2002, international funding has supported recovery and stabilization efforts at the site. Fragments of the statues are documented and stored with special attention given to securing the structure of the statue still in place. It is hoped that, in the future, partial anastylosis can be conducted with the remaining fragments. In 2009, ICOMOS constructed scaffolding within the niche to further conservation and stabilization. Nonetheless, several serious conservation and safety issues exist and the Buddhas are still listed as World Heritage in Danger. In the summer of 2006, Afghan officials were deciding on the timetable for the re-construction of the statues. As they wait for the Afghan government and international community to decide when to rebuild them, a .3 million UNESCO-funded project is sorting out the chunks of clay and plaster — ranging from boulders weighing several tons to fragments the size of tennis balls — and sheltering them from the elements. The Buddhist remnants at Bamiyan were included on the 2008 World Monuments Watch List of the 100 Most Endangered Sites by the World Monuments Fund. Scientists also found the beginning section of the original Sanskrit Prat?tyasamutp?da Sutra translated by Xuanzang that spelled out the basic belief of Buddhism and said all things are transient. On 8 September 2008 archeologists searching for a legendary 300-metre statue at the site of the already dynamited Buddhas announced the discovery of an unknown 19-metre (62-foot) reclining Buddha, a pose representing Buddha’s passage into nirvana. The UNESCO Expert Working Group on Afghan cultural projects convened to discuss what to do about the two statues between 3–4 March 2011 in Paris. Researcher Erwin Emmerling of Technical University Munich announced he believed it would be possible to restore the smaller statue using an organic silicon compound. The Paris conference issued a list of 39 recommendations for the safeguarding of the Bamiyan site. These included leaving the larger Western niche empty as a monument to the destruction of the Buddhas, a feasibility study into the rebuilding of the Eastern Buddha, and the construction of a central museum and several smaller site museums. Work has since begun on restoring the Buddhas using the process of anastylosis, where original elements are combined with modern material. It is estimated that roughly half the pieces of the Buddhas can be put back together according to Bert Praxenthaler, a German art historian and sculptor involved in the restoration. The restoration of the caves and Buddhas has also involved training and employing local people as stone carvers. The project, which also aims to encourage tourism to the area, is being organised by UNESCO and the International Council on Monuments and Sites (ICOMOS). The work has come under some criticism. It is felt by some that the empty niches should be left as monuments to the fanaticism of the Taliban, while others believe the money could be better spent on housing and electricity for the region. Some point out tourism as a draw to rebuild the Buddhas which would aid the surrounding communities. Revealed For The First Time Ever ! The Insider Secrets For Generating Free Traffic To Any Niche Or Website! Photo of Aileen Bennett was captured at the Niche Affiliate Marketing System Workshop held in Atlanta, GA on January 29-February 1, 2010.